The palm trees, the shining sun, the picturesque fishing villages and the sumptuous coves...These are the things that characterise the Algarve. Often considered the California of Europe, this region in southern Portugal, at the end of Europe, is a real gem. From the sweet scent of the orange groves to the intoxicating smell of wine cellars and the intense flavours of the seafood markets, all your senses will be awakened in the Algarve. Are you still hesitating? Discover 8 reasons to visit the Algarve. The beaches are the main attraction of the Algarve. And for good reason! These golden shores are rather wild and nestled between steep cliffs with secret caves that will make your travel photographs. Stroll on the Praia da Marinha, the most famous beach of the Algarve and go to the Praia de Odeceixe, which is more quiet and intimate. From Faro, join Ilha Deserta by ferry, also called Ilha da Barreta. As its name indicates, this island is deserted and offers spectacular landscapes composed of sand dunes, clear waters and abundant biodiversity. Finish your tour of the Algarve beaches with the Praia de Vale Covo, a beach surrounded by rocky cliffs where you can admire a cave both secret and iconic. The Algarve region also enchants visitors with its breathtaking natural spaces. We are lost in the Parque Natural Ria Formosa, a jewel accessible from Faro. Located east of the Algarve, Ria Formosa is actually a large swamp that extends from Vale do Lobo to Tavira. Here you’ll find virgin and wild beaches, a mosaic of lagoons, salt waterways and sandy islands. You will sometimes meet fishermen in search of their next catch, and will be introduced to the local flora and fauna. 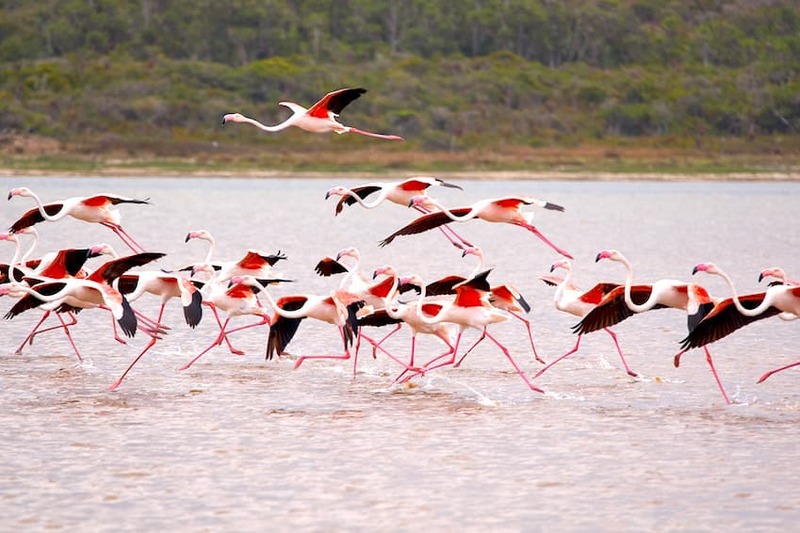 Among the species of Algarve, discover egrets, storks but also flamingos and whistling ducks. The ecosystem, meanwhile, is rich and varied, alternating between marshes, golden dunes and atypical birds. Spanning more than 18,000 hectares, the Parque Natural de Ria Formosa also offers a boat trip to five emblematic islands: Barreta, Culatra, Armona, Cabanas Island and Tavira Island. 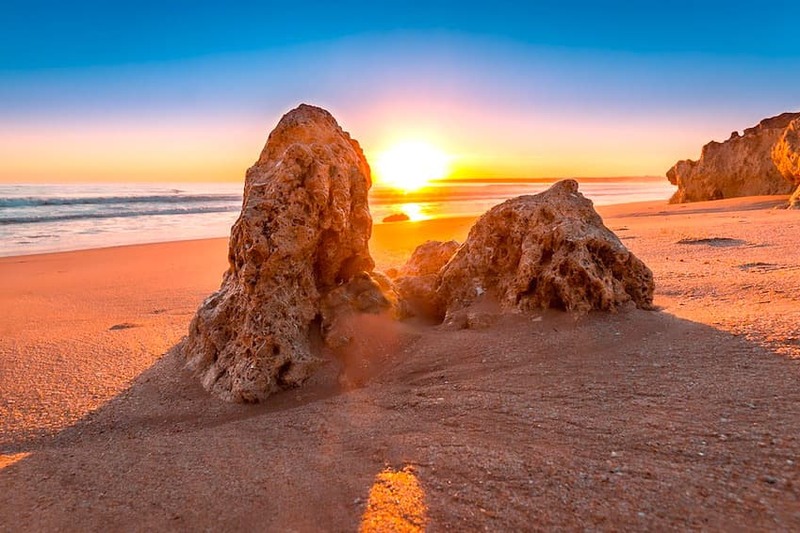 Mild and warm, the Algarve enjoys a sunny climate all year round. With mild winters, we like to walk along the wild coves of this region of southern Portugal off season. 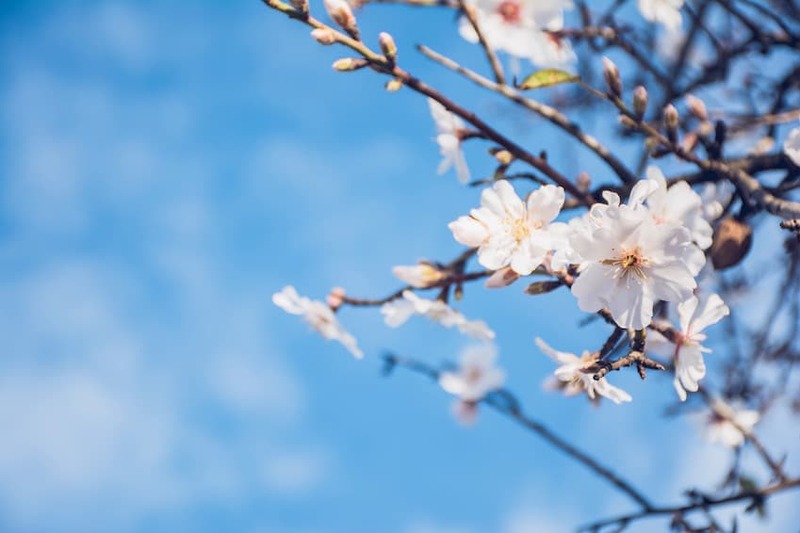 In the spring, when the sun comes out, we can admire the trees in bloom and the natural light reflected on the sand and the traditional buildings. In autumn, the leaves fall and cover the ground with a blend of oranges that can be admired in mild temperatures ranging from 10° to 18°C. But of course, it is in summer that the sun shines the most in the Algarve. With temperatures reaching 30°C in August, this region of Portugal marvels with its climate that allows you to enjoy the beaches and outdoor activities. To prolong the pleasure a little longer, we recommend renting a villa with a private pool. Thus, at any time of the day, you can cool off in a corner of paradise that will belong only to you. The Algarve is also cities of beauty, lined with historic monuments and labyrinthine streets. Head first to the sublime Lagos, an old town with cobbled streets in which you will love to wander. 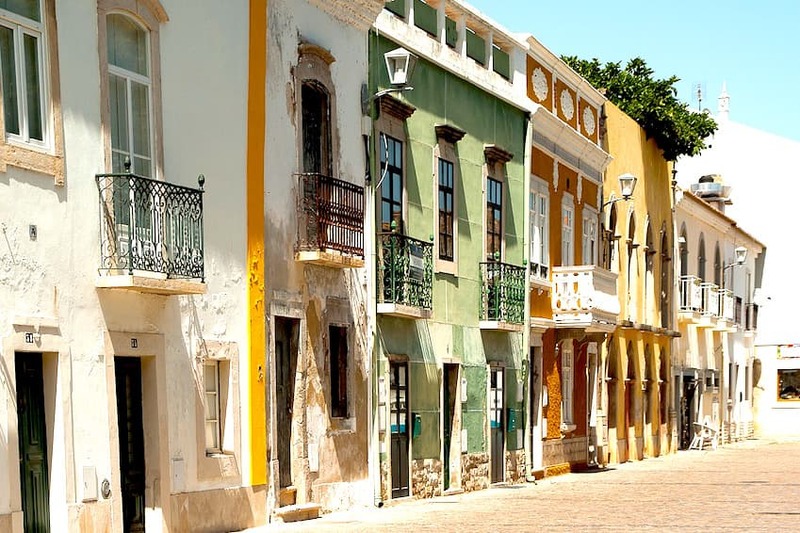 Strongly rooted in history, Lagos is definitely a must during your stay in the Algarve. Contemplate St. Anthony's Church before taking a tour of the slave market and end the day at its charming fishing port. Continue your journey to Tavira, located on both sides of the Rio Gilão, a charming city that is in full swing during the day. In the evening, find a wide choice of restaurants and bars to taste the gastronomy of the eastern coast of the Algarve. During your stopover in Tavira, do not miss the fortress of the city, a former Moorish castle. Igreja de Nossa Senhora da Assunção is also not to be missed. This church indeed displays diverse architectural styles and thus mixes several eras. With gothic doors to the arches of the Renaissance, this church will make you travel in the blink of an eye! 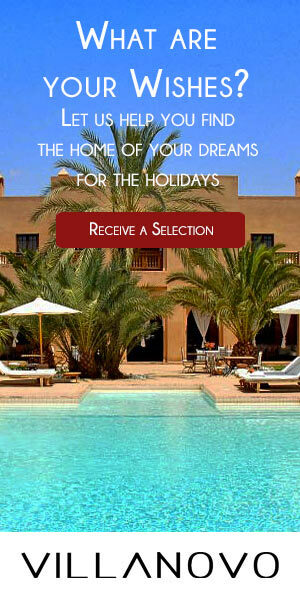 Enjoy your getaway in the Algarve and experience intense emotions by trying out unusual experiences. With family or friends, the Algarve has not finished surprising you. To get your adrenaline pumping, try go karting or visit this beautiful region of Portugal by buggy. This is a truly unique way of exploring the region! It is also possible to organise various boat excursions to observe the wildlife in Parque Natural Ria Formosa. The Algarve is also recognised for its environmental sensitivity. 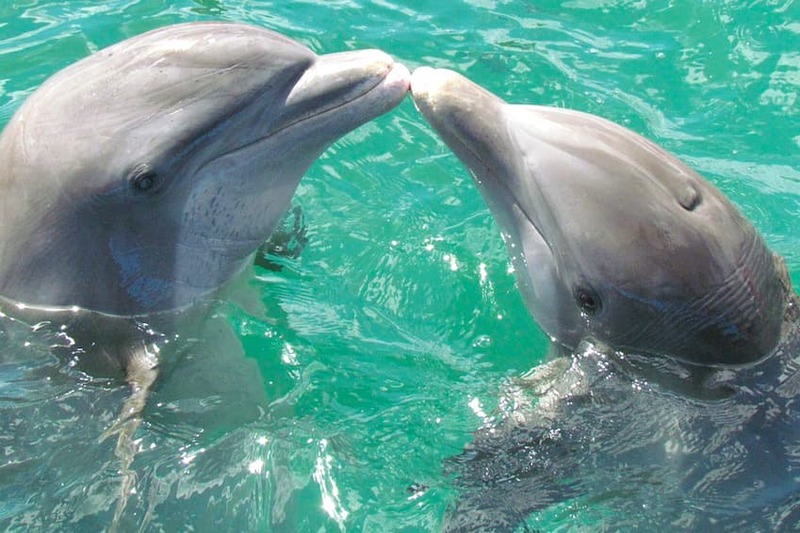 This is why we recommend going swimming with dolphins from Albufeira or Lagos. Besides the many hiking trails that offer fantastic views of the Portuguese nature, you can also practice various watersports. Among the most popular in the region for surfing are Tavira, Sagres or Lagos. In Faro, kayak tours will allow you to discover the beautiful region of the Algarve in an unusual way. During your stay in Algarve, you can savour the culinary treasures of this sunny region of Portugal. Of course, the gastronomy of the sea is delicious. If you like fish and seafood, you will be spoiled! We recommend trying octopus rice and seafood cataplana. 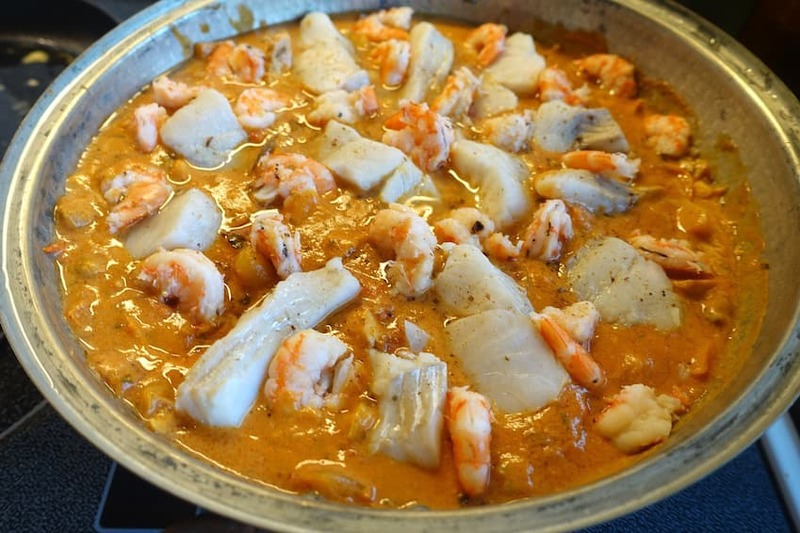 This dish is a mixture of stewed tomatoes, onions, peppers and crustaceans. A real treat! The most adventurous can order a cassoulet of whelks, an amazing specialty that is no less delicious! For dessert, you'll be spoilt for choice. From fig and carob tart to a sweet potato cake that is widespread in the Aljezur region and a multitude of pastries made from marzipan, those with a sweet tooth will be delighted with the Algarve! On the water or, even better, underwater, admire the fascinating aquatic life of the Algarve. Though scuba diving and snorkelling are practiced all year long, we advise putting on your mask and your snorkel especially in spring or fall. 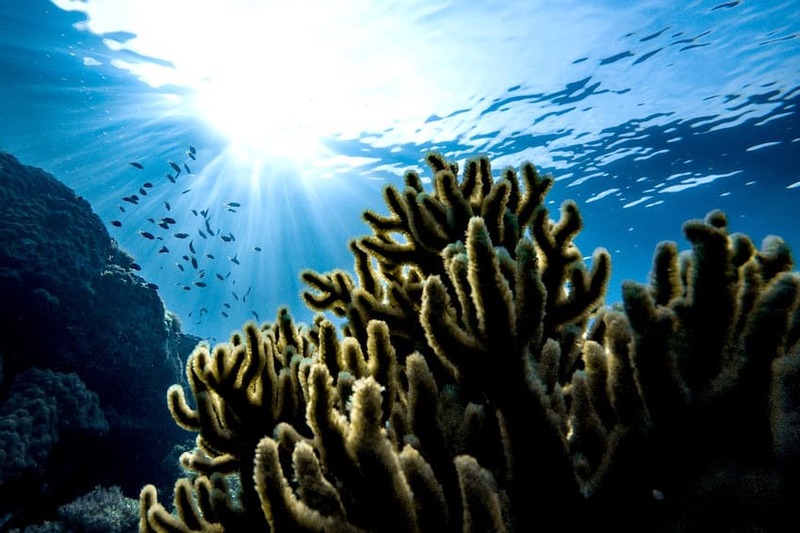 Among the most beautiful scuba diving sites in the Algarve, do not miss the Ocean Revival Park. Here, you will see four shipwrecks that have been sunk in one spot to create an artificial reef. The region of Sagres is also ideal for all divers. The sand is dazzlingly white and the atmosphere tranquil, creating a dream environment for venturing into the deep sea. Finish by Lagos where, under the sea, the rocks form lagoons in which fish love to gather. Shrimp, anemones, octopus and multicoloured lobsters and gorgonians can also be observed. If the Algarve tends to be a tourist region, especially in summer, you are advised to escape into the hinterland through Via Algarviana. Here, the villages are traditional and the beauty of the landscapes, breathtaking. The Via Algarviana is also the perfect opportunity to organise a hike or a beautiful horseback ride with family. 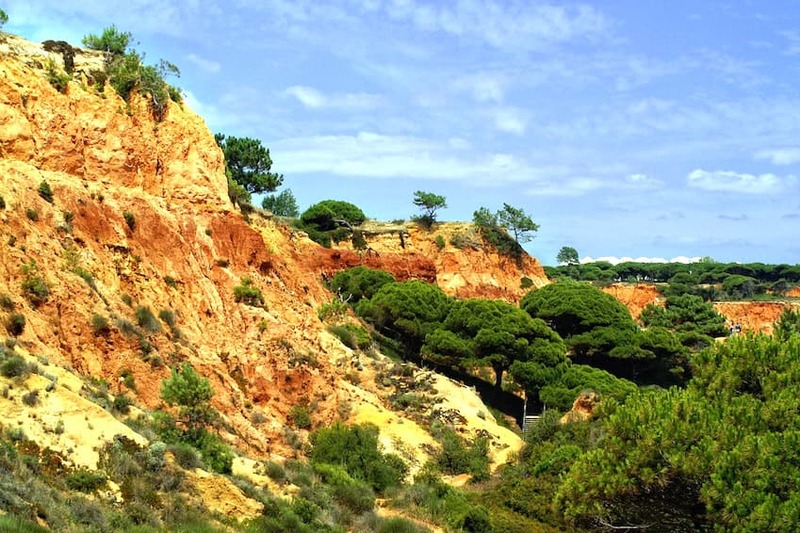 Stroll along the marked trails of the Algarve hinterland and discover rolling hills, pines and gorse. To take a break, enjoy the outdoors or just admire the Portuguese nature, the Via Algarviana is perfect. Along the way, smell the flourishing vegetation that mixes rosemary, lavender and thyme and bathe in the cool waters of nearby rivers and streams. At its peak, the Via Algarviana ends in the Parque Natural do Sudoeste Alentejano e Costa Vicentina, one of the best preserved coastlines in Europe.